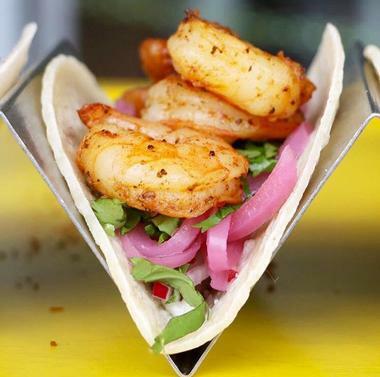 There are many amazing seafood restaurants in Miami and choosing where to go depends on the neighborhood, preference and budget. 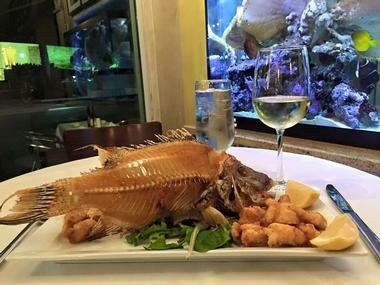 Miami seafood restaurants range from casual no-frills places where fresh fish comes on cardboard plates, to posh white tablecloths and unique wine pairings. Some are on the Miami River, providing an ultimate pleasure, such as enjoying the sunset over the Miami skyline and watching the boats pass by. Estiatorio Milos is an interesting marriage of a Greek fish market and an upscale white tablecloth restaurant; bright, airy, and with touches of white in swathes of curtains, this place brings to mind sailboats on the azure waters of the Aegean Sea. As you walk into the restaurant, you pass by the display of fish, most of which you have never heard of, that have been flown straight from Mediterranean fishing boats. To preserve the exquisite flavor of most of the fish, their preparation is very simple, mostly grilled or broiled and served with steamed or fresh vegetables. The best value is provided by the chef’s tasting menu, which comes with a wine pairing. Of the roughly 200 labels, about 90 percent of the wines are from the Greek islands and complement fish wonderfully. The whole experience is exquisite; even in a city so full of fresh fish, it is nice to taste something different. GK Bistronomie is a massive, sleek, modern Peruvian restaurant in up-and-coming Wynwood, where Chef Rafael Perez waves his magic wand in the open kitchen, preparing Peruvian dishes from his childhood with his own twist and interpretation. Try his ceviche with shrimps smoked in cherry wood, avocados, tomatoes, caviar, mustard seeds, red onion, oranges, and plantain chips. The chef’s inspiration is global and there are interesting combinations, such as Scottish salmon with heart of palm, pineapple, aji amarillo, bok choy and beurre blanc. There is a lot of interesting art on the walls, with sea creatures dominating. The art also extends to the plates, which are almost too beautiful to eat. Pisco drinks in all varieties are the drinks of choice for the fun crowd that frequents this popular restaurant. Located on the top floor of the EPIC Hotel, trendy Area 31 has the reputation of the best view in town as well as exceptionally good food and cocktails. Sunset over the Biscayne Bay and the city skyline from the restaurant’s poolside terrace is absolutely breathtaking, but Executive Chef Wolfgang Birk manages to draw the attention of his guests with his frequently changing menu that is based on sustainable ingredients and focuses on local seafood with a Spanish twist. The menu is extensive but the chef’s fresh ceviche, crudos and tartares are legendary. 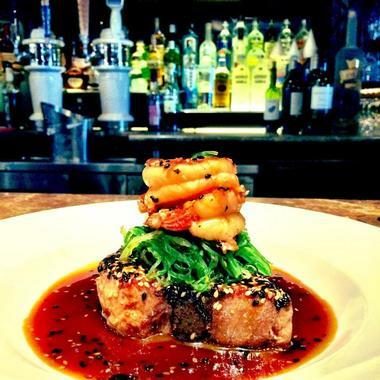 The bar is hopping with ‘beautiful people’ during happy hour, and the sunset prix fixe menu is exceptional value and a great way to sample many of the chef’s delights. When they renovated this former 1930s gas station across from a historic Miami cemetery, they did a fantastic job of keeping the floor-to-ceiling windows that flood the cozy banquettes and tables with light. There is usually a diverse bunch of customers, from locals craving fresh oysters to business types wanting to impress their clients with the several kinds of caviar on the menu. And that is the interesting thing about Mignonette: It is both fancy and unpretentious, so everyone fits in. The food is also divided into ‘plain’ and ‘fancy’ and there is even ‘super fancy’. 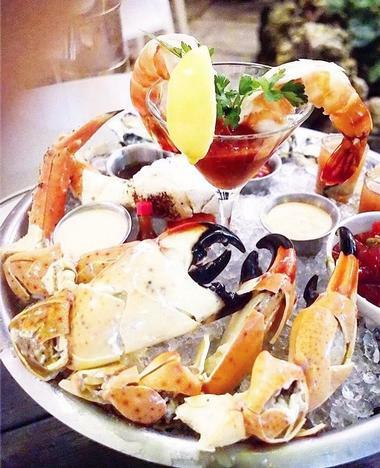 If you want to try a bit of everything, go for the seafood tower with clams, oysters, shrimp and crab cocktails, lobster tail, and crab legs. Their interesting wine list also has something for everyone. 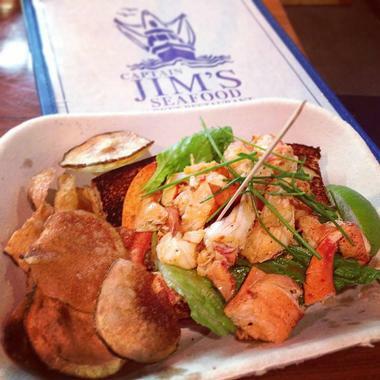 Located in north Miami, Captain Jim’s Seafood Restaurant and Market is a no-frills casual restaurant that has not spent too much on its décor because it is all about great food. It is spacious, portions are large, prices are really good, and the fish, crabs, and oysters come straight from the boat or from reliable sources around the world. Don’t expect white tablecloths - the food comes in a cardboard box or tray and is served with thick fries or a baked potato and a generous dollop of creamy coleslaw. You can also get a lemon wedge or some tartar sauce and grab your own utensils and napkins. The food is so delicious that you will be licking your fingers, but in the low-key place like this, nobody will mind. Stop by their fish market downstairs and pick up some fresh or frozen fish to take home. 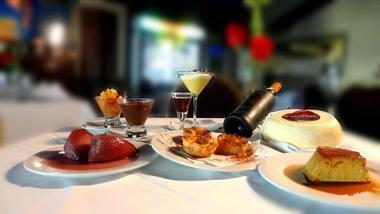 When you come to Old Lisbon in Coral Way, Miami, and listen to the Portuguese chatter of the guests, you will know that you are in the right place to try homemade traditional Portuguese dishes and some select Portuguese wines. 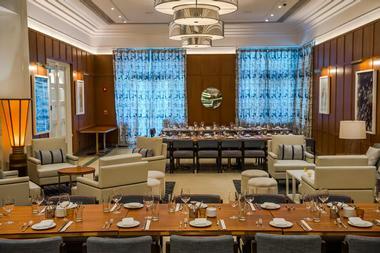 The dining room is elegant without being pretentious, with white tablecloths and a discrete décor. 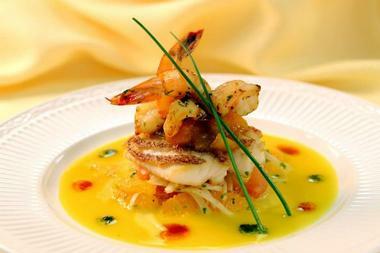 The focus is on the food and while the menu is full of diverse seafood dishes, there is something for everyone. Their lunch menu changes daily, so if you feel like top sirloin slices with black beans and white rice, come on Monday. For three kinds of codfish, come on Friday. 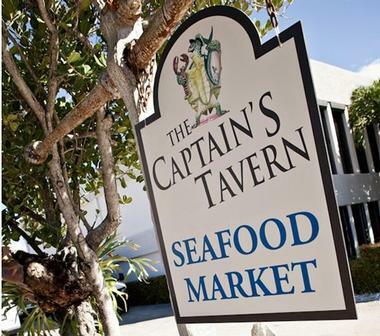 Located in the renovated old post office, tucked into the shadows of the South Dixie Highway, Captain’s Tavern has been south Miami’s favorite seafood place since the early 1970s. Dark woods, brick walls, dim lighting, and good quality nautical art and antiquities create a pleasant dining atmosphere. Aquariums filled with colorful sea creatures provide a lovely distraction while you await your meal. The freshest fish and seafood come from their next-door Seafood Market and they also have meat and poultry. Their wine list is outstanding, with some very special labels as well as drinkable yet affordable table wines. An absolute must is their 2-for-1 Maine lobster dinner every Tuesday night. 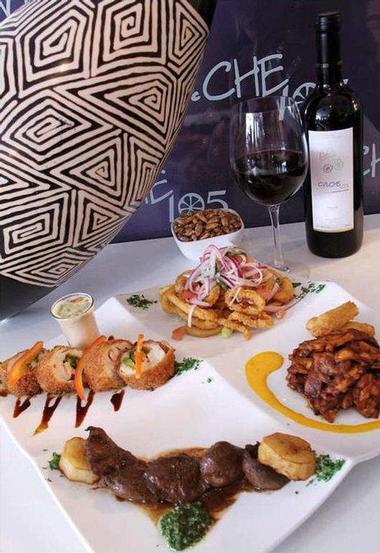 One of the most popular Peruvian restaurants in town, CVI.CHE 105 is huge contemporary restaurant with minimalist white furniture, original art on the walls, and vivid touches of color from Peruvian textiles and art pieces. Very hip and modern, this downtown place is filled with the young and beautiful, who come to see and be seen but also to taste the restaurant’s renowned ceviche and other traditional, authentic Peruvian dishes such as aji de gallina, which has pieces of shredded chicken breast with pecans, milk, Peruvian yellow pepper, cream, piso bread, and parmesan cheese. Most of their interesting cocktails are made with pisco, but they also have nice wines by the glass or bottle. You can sit on the terrace at Garcia’s, watching them haul the fish from their own boat or enjoying the sunset over Miami while your grouper sandwich is being put together. This old-fashioned Miami seafood shack has been around since 1960 to the delight of its faithful customers. It is a wonderful spot to enjoy fresh seafood outside on rustic picnic benches or inside in cozy boots with banquettes. If you want to sample a few goodies, go for their large appetizer menu. On the way out, stop at their downstairs seafood market to pick up some fish for tomorrow. Jardim de Portugal will greet you with the atmosphere of a friendly neighborhood gathering place and the smells from the open kitchen will lure you in to find out what is cooking. Often busy and buzzing with friendly conversation, Jardim offers homemade freshly prepared traditional Portuguese food, delighting both those who love and crave good Portuguese food as well those who have never tasted it but who will leave as fans. The menu is mainly devoted to seafood, especially codfish, which comes in all shapes and forms and is the staple of Portuguese cuisine. They have some nice Portuguese wines as an accompaniment. Jardim also delivers, so try a few different things so you know what to order for your next house party. 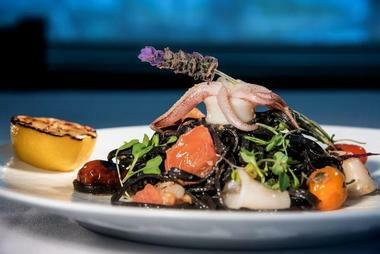 Located in Loews Miami Beach Hotel, the Lure Fish Bar is elegant and upscale, with a beautiful, comfortable dining room and a spectacular outdoor terrace overlooking the beach. With a separate entrance, gleaming woods, cool blue tones, tasteful nautical décor, and well-dressed guests, Lure is the place to come for a special event or even just for the very good selection of fresh seafood and the spectacular raw bar with oysters from both coasts as well as imaginative sushi. 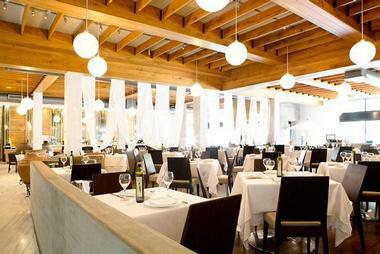 Located in the Brickell Area near the Miami River, the River Oyster Bar is the ultimate destination for oyster lovers. They have the finest selection of oysters in Miami and, depending on the day, you will find Blue Points, Cormandel, Wellfleets, Quonset Points, and many others. 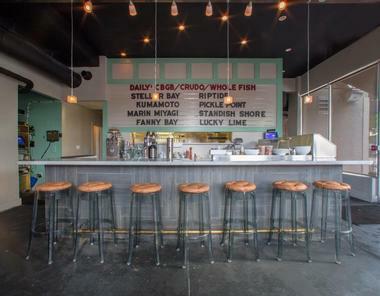 The raw bar is enormous and besides oysters you will find ceviche, sushi, and more. Don’t be fooled by the crowd at the bar, it is more than the local watering hole. The restaurant at the back is sophisticated and elegant, and the menu goes far beyond raw seafood and hot cocktails. The best value is the prix fixe lunch, which usually combines oysters, gazpacho, a choice of fish or meat, and a sinful dessert. This place is hopping during the happy hour, with fun innovative cocktails and a large wine list. A Fish Called Avalon is the place to be if you want to combine people watching on front-row seats at the Strip with great seafood and excellent wines. Located in the upscale Avalon Hotel for the past 25 years, this restaurant has been a favorite of locals who know how to appreciate the finer things in life. Its lovely dining room in the hotel’s art deco lobby is both cozy and luxurious, but the outside porch is a highly coveted spot for afternoon drinks or a romantic dinner. A live Latin-Caribbean duet adds to the very special atmosphere. Chef Kal Abdalla is a master with fresh seasonal ingredients and uses the bounty of the sea and the land to prepare inventive and delicious meals. Try his baked Maine lobster filled with spinach, chanterelle mushrooms, saffron rice, and Champagne sauce. Avalon has a great wine selection and their mojitos are legendary. With no view of the sea or the city and just a few blocks from the airport, Catch of the Day does not have a location to recommend it, but it still manages to be a city institution and has been a popular dining spot for decades. It has a sports bar vibe, with island-themed décor and a nice spacious outdoor area with live music on most nights. 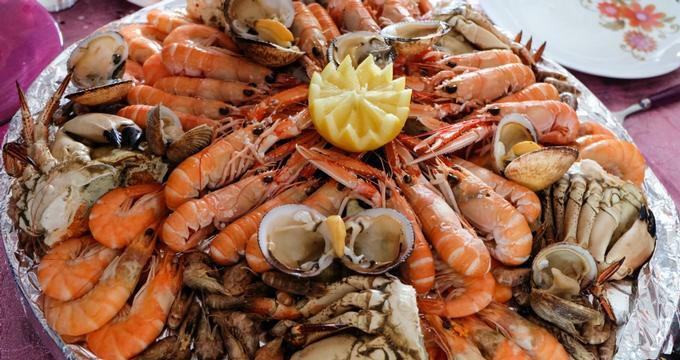 The food is traditional, seafood-focused, with fish, crab, shrimps, lobster and other sea critters featuring in such dishes as fish chowder or the popular seafood platter. The most popular dishes are the Flying Whole Red Snapper and the rich seafood paella, but the menu is enormous and there is something for everyone. The list of cocktails, wines, and beers is similarly extensive and the drinks are generous; no wonder the place is always packed! Not all places on fashionable Ocean Drive are fancy and upscale. CJ’s Crab Shack manages to retain the atmosphere of a family-operated waterfront crab shack with great food and less expensive cocktails. Its fantastic front-seat location is a bonus for people watchers. The décor is old-fashioned kitsch Miami with shell-decorated mirrors, tea-light lanterns at night and Bob Marley blasting from the speakers. The second-floor bar has quirky murals and colorful stained glass windows, bathing the place in a romantic reddish glow. Comfy lounge-like couches, dart boards, a juke box, and a pool table complete the picture of a comfortable place for hanging out. Crabs dominate the menu, but there is also a very good raw bar and a lot of fish and seafood. 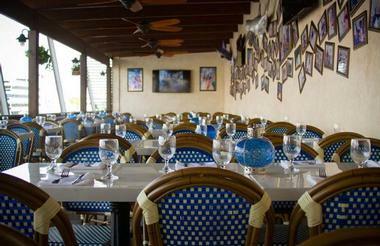 Fifi’s is one of those hidden gems not far from the beach that locals discover and keep returning to – the food is spectacular, the dining room is cozy and spacious with beautiful original art on the walls, and there is often live music in the evening. White tablecloths give it an upscale look without being pretentious, but the portions are generous, the menu is extensive, and the prices are reasonable for Miami, making Fifi’s an attractive place for family dining. Their house specialty is hog snapper, supplied to them every day by their own diver. He also catches lobster when in season. 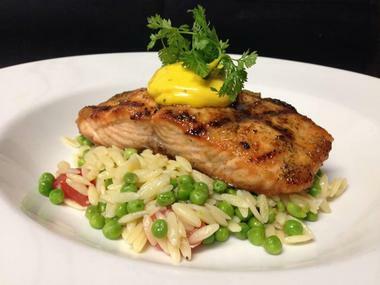 At Fifi’s they are committed to serving only locally caught and sustainable fish and seafood, with dishes ranging from Japanese and Spanish to everyone’s American favorites. 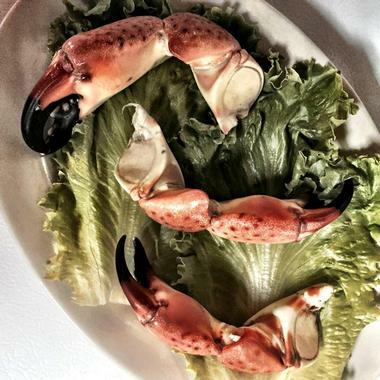 More than 100 years old, Joe’s Stone Crab is a Miami institution, one of the most popular tourist attractions, and absolutely the best restaurant in town. It is massive, with Spanish villa décor, white tablecloths, and tuxedoed waiters and, regardless of the number of tables available, it is always packed for dinner, with a long wait for a table. Those who hate to wait just come for lunch when there is no crowd, or take their dinner home – Joe’s takeout is very popular. The specialty of the house are the stone crabs, so when they are out of season from May to October, the restaurant closes. 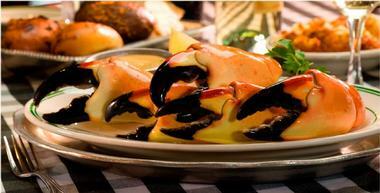 Stone crabs have a very specific flavor and at Joe’s they are served in any shape and form, but the most popular are the crab legs with a secret sauce, fried sweet potatoes, creamed spinach with garlic, hash browns and coleslaw. Other items on the menu are great but crabs are the reason people come and so crabs they get. When a family of exiled Cuban fishermen open a fish market, you can count of super-fresh fish and seafood. La Camaronera changed its name a few times and quickly grew to serve fish to the neighbors, who would come to munch on fried breaded snapper, drink soda, and discuss politics or sports. 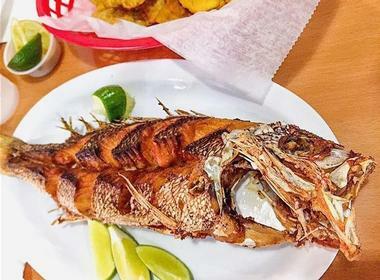 Fifty years later, La Camaronera is now a full-sized restaurant, simple and unpretentious, with a small menu of amazing dishes and the best fish sandwiches in town. The bread is original, house-made Pan con Minuta, light and fluffy, barely able to contain the huge chunks of breaded snapper, shrimps, or lobster. The only complaint the locals have is that this amazing little place is no longer their own secret. What started as a takeout window in South Beach became a chain taking over Florida with fresh, healthy ceviche, salads, burritos, and tacos. Most restaurants now have sit-down space, but the atmosphere is the same everywhere: Fresh seafood or free-range chicken is combined with fresh seasonal vegetables, given an international flavor and offered at reasonable prices. The signature ceviche is simple: fresh locally caught seafood tossed with fresh tomatoes, cilantro, red onions, and jalapenos, all drenched in their fresh, citrus-based sauce that comes in several versions. The burritos, which are easy to carry, are very popular, bursting with flavors and big enough that you need two hands and a big appetite to eat them. Located in South Beach's Sofi neighborhood, Prime Fish is a large, upscale, sophisticated restaurant with a modern black and white interior dominated by the magnificent mural of a mermaid. Their outdoor space is even more memorable, with a patio shaded by a large spectacular tree. The menu is equally sophisticated with a fantastic raw bar and a mix of everyone’s favorites, such as lobster rolls or crispy clam strips and more upscale dishes such as Alaskan king crab lasagna and Dover sole meuniere with French beans, crunchy toasted almonds, and lemon caper butter. The portions are large, so consider sharing, especially since the prices are equally large. Located right on the shore of Biscayne Bay, surrounded by stately palm trees in the heart of the Matheson Hammock Park, Red Fish Grill is one of Miami’s most romantic spots. What was once the Matheson Hammock beach pavilion is today a cozy, elegant restaurant with superb food, whether you are dining in the beautiful stone dining room or outside under the palm trees. The menu is small but world class, with a fine balance of seafood and meats. You might want to start with tuna tartar with a yuzu-soy vinaigrette, avocado, black sesame seeds, cucumber, radishes, green onions, and plantain chips. The wine list is extensive and very carefully selected. There are also some very nice beers, both craft and international. 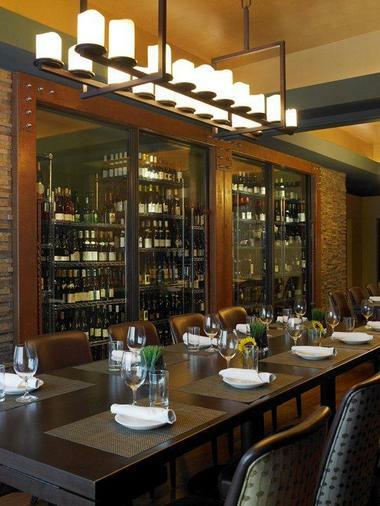 Located in Miami Marriott Biscayne Bay Hotel, Catch Grill and Bar is not a typical hotel restaurant. Its indoor dining room is elegant and spacious, but its waterfront seating is breathtaking, with a view of the bay and spectacular sunsets in a relaxed atmosphere, attracting both hotel guests and casual diners. The menu is seafood-focused, American, and traditional, with a large list of delicious appetizers and sandwiches and small but fine main plates. The bar is well stocked with a respectable wine list and interesting craft beers while the list of cocktails is a mix of the classics and some new and interesting concoctions. Their mojito is the star of the show. 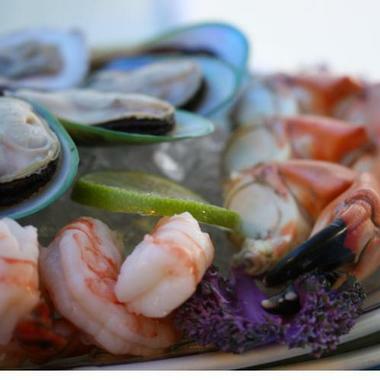 When your seafood comes from the restaurant owner’s own boats, you know you are getting the freshest seafood possible. For the last 20 years, Casablanca Seafood has been one of the favorite Miami restaurants, not only for its fantastic location on the Miami River, you can even arrive in your own boat, but also for its superb food. The large dining room is elegant and comfortable, with its wall of glass overlooking the river, but if you can, sit outside on the spacious terrace and watch the boats pass by against the distant Miami skyline. If you want to sample a bit of everything on the menu, go for the Casablanca grilled parrillada, which has prawns, clams, oysters, calamari, green-shelled mussels, and grilled fish fillet and is served with vegetable ragout. A very respectable wine list has something for everyone from all over the world.